A few weeks ago I mentioned in the weekly newsletter that we’ve had a few overgrown zucchinis this season. 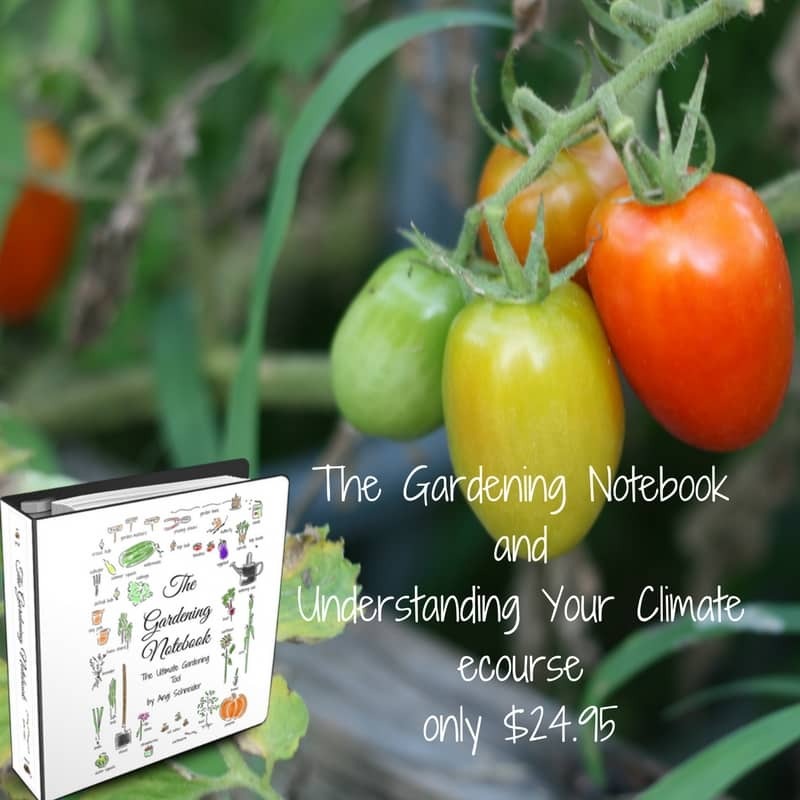 This happens every year but this year we seem to be having more than normal and I already have enough dehydrated and frozen zucchini for the year. I’m trying not cook sauteed zucchini every evening and needed to come up with something to do with these huge zucchinis. I decided to make zucchini lasagna. 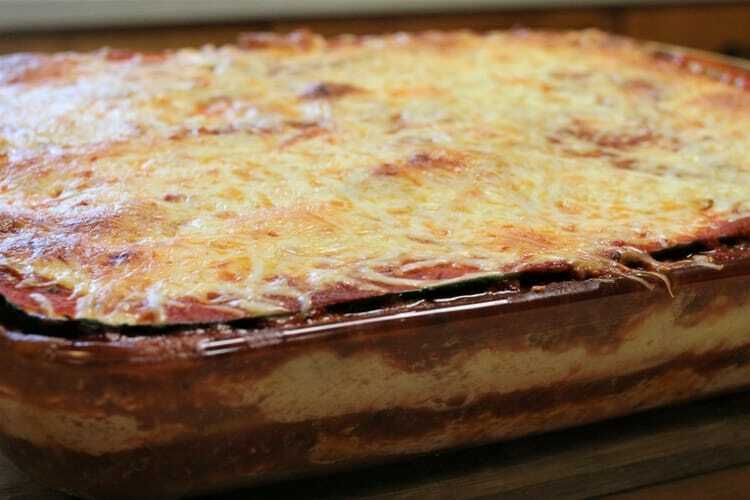 I used our regular vegetable lasagna recipe and tweaked it so my family would eat it. The first thing I did was slice the zucchini in strips to use as the noodles. The other thing I did was decide to add meat to the sauce. I normally don’t put meat in our lasagna because it’s a fairly expensive meal for us but since I don’t need to buy noodles this time, I added meat. Lastly, I didn’t add any other vegetables to it. My family love it! Goodness who wouldn’t? It’s just like regular lasagna but with zucchini noodles instead of pasta noodles. And no, you can’t taste the zucchini because zucchini does’t really have much of a flavor. In order for the zucchini lasagna to not be watery I salted the zucchini noodles and let them drain, just like I do when I make zucchini fritters. I just layered them in a colander that I had sitting in a large bowl. It worked really well. I let it sit for about 30 minutes. 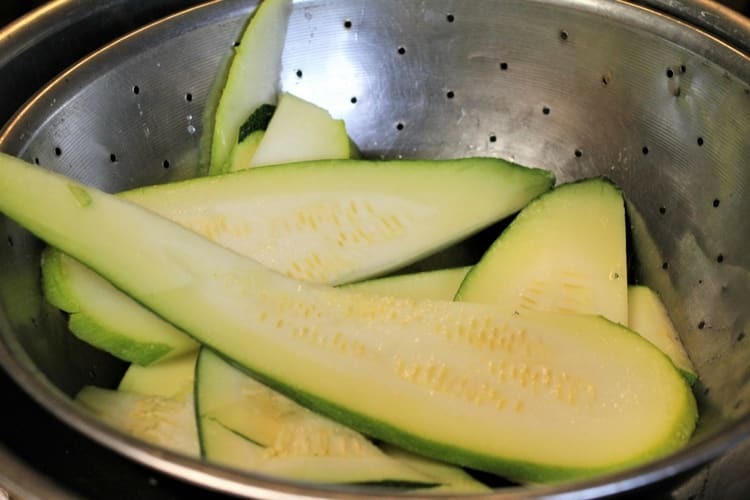 When I took the zucchini slices out of the colander to use them, I patted them dry with a towel. I’ve made this several times now and sometimes I just cut the zucchini in 1/4″ or thinner slices and sometimes I use a hand held vegetable peeler to make thin ribbons. 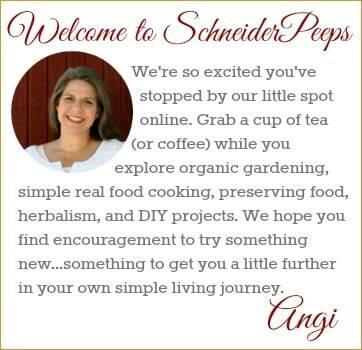 My family has liked it both ways and there is no time savings with the vegetable peeler. However, there is more waste with the vegetable peeler. (I do like this peeler for making “spaghini” which is what my family is calling it when I make zucchini noodles and put thick spaghetti sauce over it.) 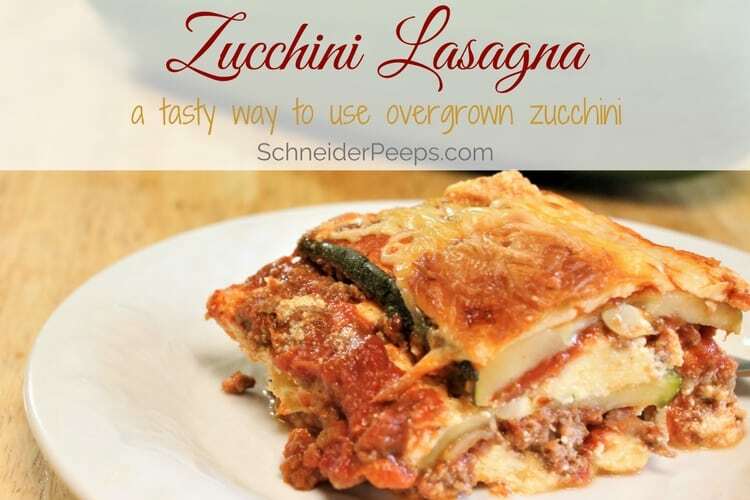 The point is, you do not need another gadget to make zucchini lasagna. 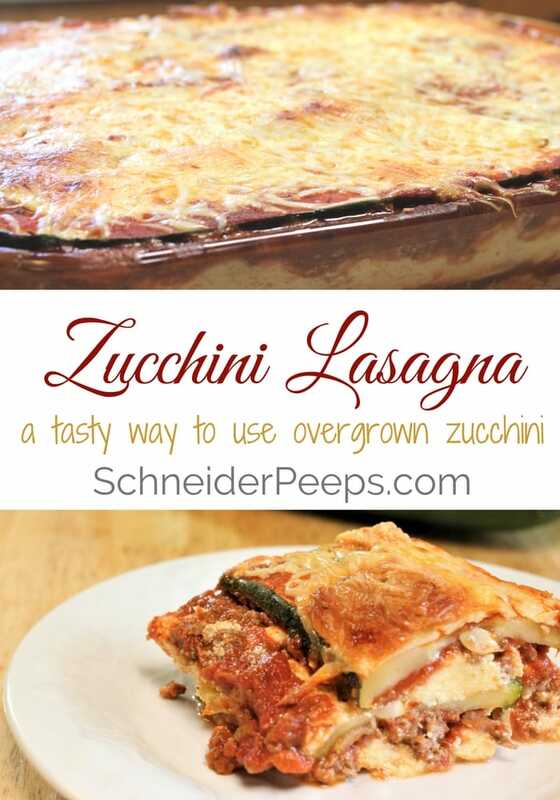 There’s nothing special about layering a zucchini lasagna as opposed to a regular lasagna. I like to start with a bit of sauce on the bottom of the pan so I don’ need to oil the pan. You can oil it if you want but I think it cleans up just fine without the oil. 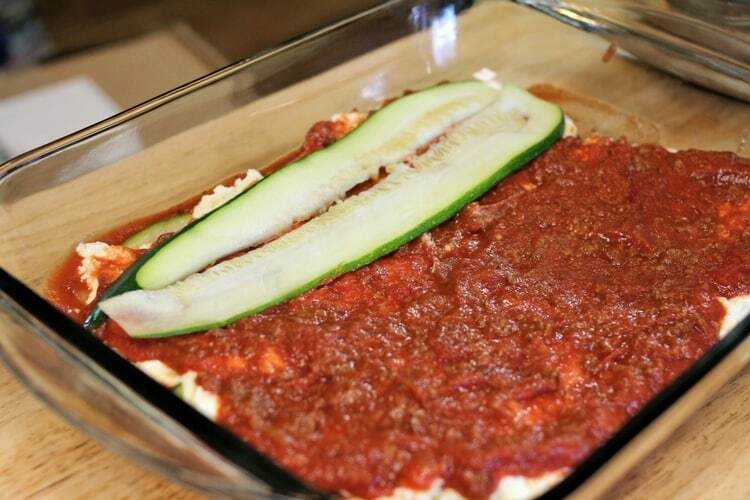 After the first layer of zucchini, put a layer of the ricotta cheese mix and then a layer of the thick meat sauce. I made the sauce extra thick by adding tomato paste to keep the lasagna from getting watery. Then put another layer of zucchini, ricotta and meat sauce. Put one last layer of zucchini on top and sprinkle mozzarella cheese on top. You can cover it with foil while it cooks and then take the foil off the last 10 minutes or so. We kind of like the crunchy cheese part so I don’t do that. The full recipe and and process is below. 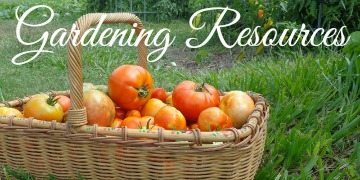 Some of the measurements are estimates because it’s hard to quantify two overgrown zucchinis. This does make a full pan. I used my largest baking dish which is about 11X15X3 and still overflowed while cooking. You can make less or use two small pans if that’s better for you. 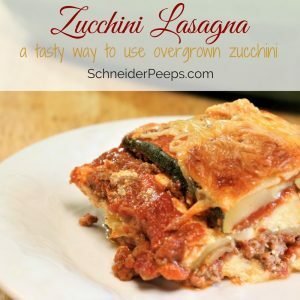 This zucchini lasagna recipe is a delicious way to use zucchini that won’t leave your family grumbling. 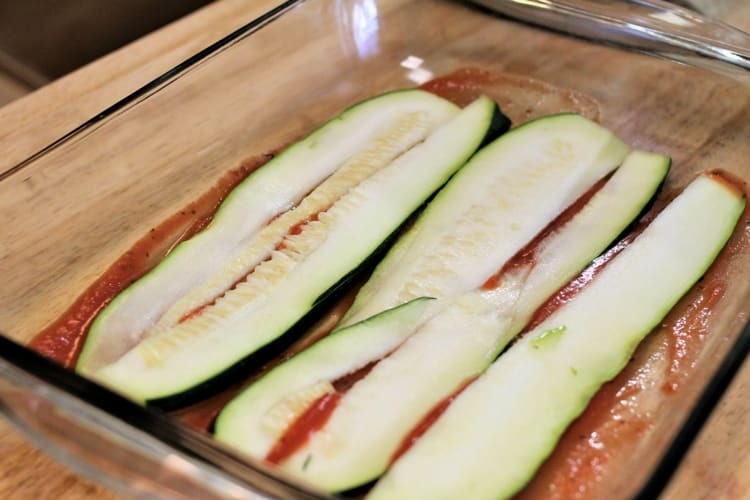 Cut zucchini into strips about 1/4″ thick or less. Salt the strips and lay them in a colander for about 20-30 minutes to remove excess water. Put a bowl underneath colander to catch water. Dice the onion and cook it with the ground beef in medium or large sauce pan. Once cooked, strain excess oil if needed. Add to spaghetti sauce, diced tomatoes, and tomato paste to cooked meat. The meat sauce will be very thick, this is what you want so the lasagna isn’t watery. In a medium size bowl mix ricotta cheese, four eggs, Parmesan and 1 cup mozzarella cheese together. Put a small amount of sauce on bottom of large casserole dish (mine is about 11″X16″X4″) or spray casserole dish with oil. 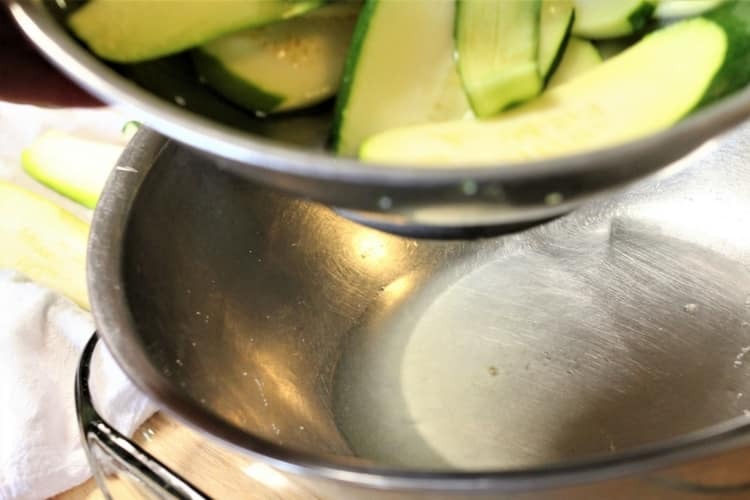 Dry the zucchini noodles with a clean towel before using. Cover bottom of pan with zucchini strips. Add a layer of the ricotta mixture and a layer of the meat sauce. Repeat the zucchini, ricotta mixture and meat sauce layers. Top with a layer of zucchini and sprinkle with mozzarella cheese. Bake at 350F for about 45 minutes to an hour, until the zucchini is soft. You can cover the lasagna with foil and remove it for the last 15 minutes or so if you don’t want your cheese brown and crunchy around the edges. Let sit for 5-10 minutes before serving.